It’s been a week since my mom went home. 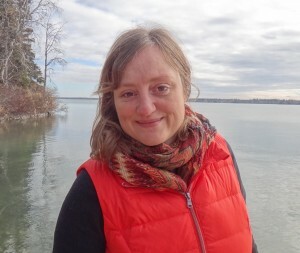 I ended up driving her to Flin Flon – along with another woman stuck in The Pas because the plane couldn’t land on last Thursday’s icy tarmac – in order to catch her flight to Winnipeg, then on to Toronto. She made it home okay, if a bit tired, and I took Mowat for a run, bought some yarn to continue my Christmas knitting, and got some sun in Flin Flon (that seems like a funny thing to say, but it was overcast down here, as it’s been for days and days and days and…). The real gem of her trip out here, though, was our journey up to Churchill to try to spot some northern lights for VIA. I gotta hand it to her: not too many 70-something-year-olds would catch a cab at 3:30 a.m. in order to board a train for 27 hours, bound for the sub-Arctic. But, then, she’s not an ordinary person. Riding the rails with my mom. Both of us were fascinated by the gorgeous rocky terrain, the incredible art and the history of the town and its surroundings, a lot of which we explored for the article. I can’t wait to go back and bring Jason – next time, I hope, to snorkel with the belugas. My mom and I walked everywhere, which in hindsight was maybe not such a great idea since, in the past five months, we learned, the Polar Bear Alert line has had over 250 calls! One night our cabbie veered off the route to our hotel (okay, after dark we took taxis, as per the Safety in Polar Bear Country brochure) to point out the indoor playground in the town centre with its floor-to-ceiling windows. All this prepping made it better, though, when we actually did see some bears. Do not get off the bus. We weren’t brazen; we didn’t hang out of the windows to get the best shots. 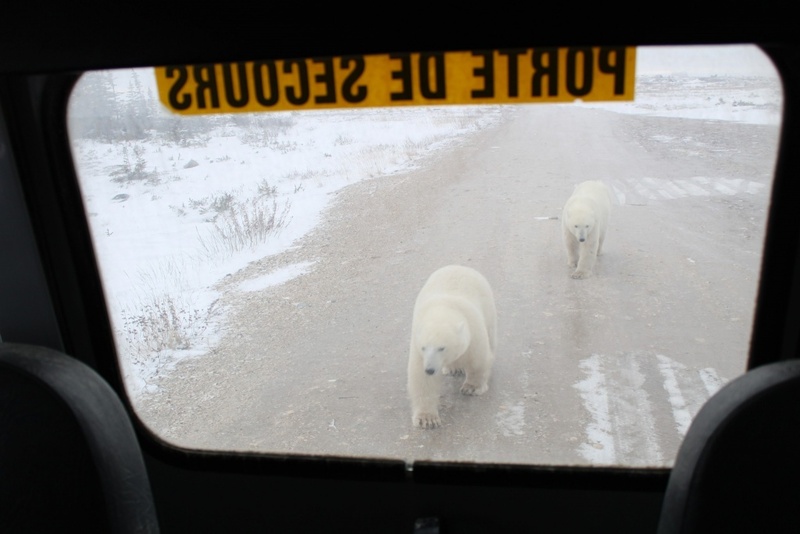 Instead, I felt a wee bit afraid as these two polar bears roamed around the small bus we were in. It actually seemed a bit like being in a zombie movie. Unfortunately, with the above-mentioned constantly overcast skies, we weren’t able to see any northern lights, but that will soon change. Eventually (because God help us all when it doesn’t….) the bay will freeze over as it needs to in order to maintain this important eco-system. Once that happens, the nights will clear, opening the way for the sort of astonishing light shows that photographer Alex de Vries captures on film. 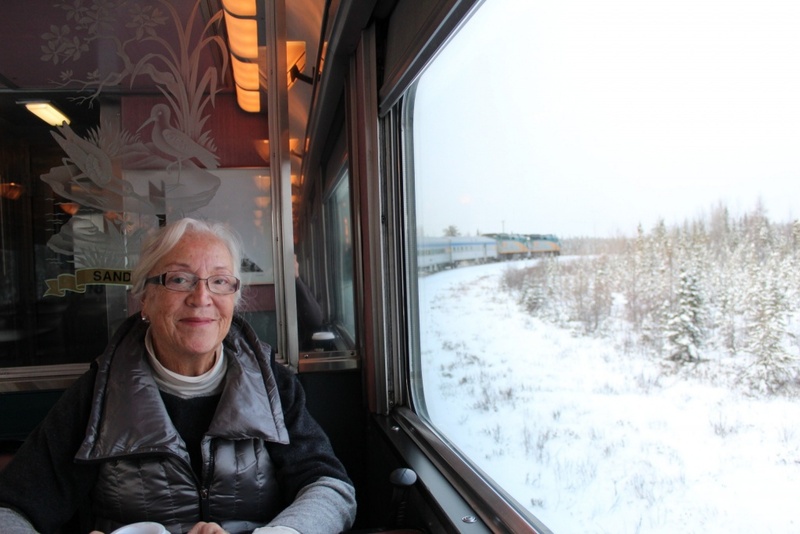 If you’re looking for a once-(maybe-more)-in-a-lifetime, bucket-list-worthy adventure, check out my article, climb aboard and head for Churchill (and don’t forget to stop in at The Pas). 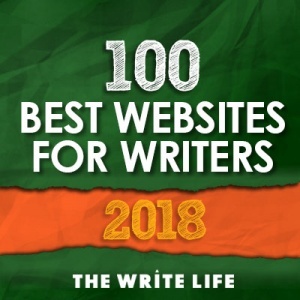 I read your blog and the article was wonderful! 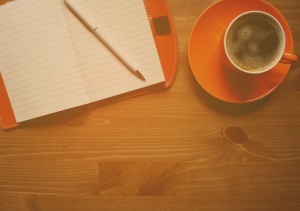 So glad to see your writing again. What an incredible adventure! So glad you were able to have such a healing distraction in the midst of sadness. I think of you daily. Take care.